Buttercream Frosting is an excellent frosting for decorating a cake with details. The consistency of this frosting recipe can be easily changed according to what type of decorations you are trying to create. Being able to adjust the consistency of the frosting is critical when you are doing detailed decorating. This Buttercream Frosting provides you with a sweet butter-flavored frosting and one that is easy to work with. 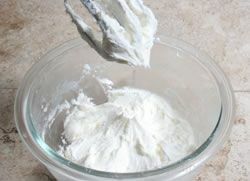 This buttercream frosting can be made a head and stored for up to two weeks in the refrigerator in an airtight container. If the buttercream frosting is stored in the refrigerator, be sure to remove it at least 1 hour before you are going to use it so it has time to soften slightly. For details on how to adjust the consistency of this frosting for different types of detail decorating, see Frosting Consistency. 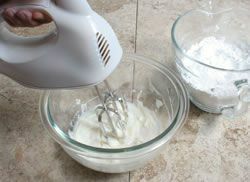 Cream the shortening and butter together on low speed just until well blended. 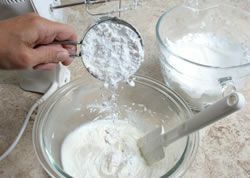 Then combine the powdered sugar, meringue powder, and salt together in a separate bowl. 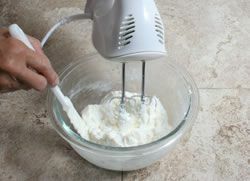 Add the vanilla and milk to the shortening and butter; mix until blended. 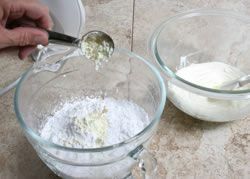 Start adding the sugar mixture approximately 1 cup at a time and mix just until incorporated after each addition. Scrape sides of bowl as you are mixing. Do not over mix. Reserve the Karo syrup for adding to thin the consistency. The Karo syrup provides better elasticity so the frosting holds together when writing and using thin piping.